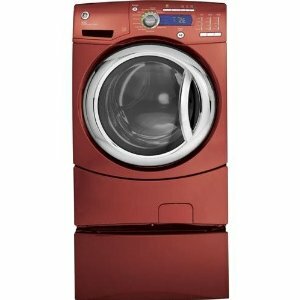 GE GFWH2405LMV Vermilion Red Frontload Washer 4.9 cu. ft. There is more to the GFWH2405LMV than its unique and rich vermilion red exterior. It also has features to make laundry easier and convenient for you. Included in this model is an eWash option, which saves you on energy by using cold water in some cycles while still assuring a thorough clean. For users who would like to use hot water, the machine has a built-in HydroHeater with sanitization, which raises the temperature of water to be used in the wash cycles. Hotter water is said to aid in producing brighter whites and making sure that common bacteria are removed. the stain wash cycle, a special cycle intended for heavily soiled items. This cycle works on hard to remove stains and gives you thoroughly clean laundry. Also included in this model is the eWash option, another energy saver feature. EWash uses cold water in select cycles for less energy use (no need for the washer to heat water anymore) but with consistently clean results. The Adaptive Vibration Control or AVC feature of the machine reduces the vibration and sound made by the washer as the mechanism adapts and optimizes the machine’s spin patterns. What you get is a more stable and quiet machine that produces less shakes and noise that can disturb your household. The door style of the machine contains a circular see-thru glass window which allows you to look inside the machine to know what’s going on even if it is in use. For some traditional household washers, you would need to open the machine to see what’s inside, which would cause the machine to stop. The handle, is made of dark chrome material, which blends beautifully with the rich vermilion color of the washer exterior. Moreover, the dark chrome material is easy to clean and does not retain stains and fingerprints. The handle is also designed with TrueGrip technology which resists slipping and allows you a stable grip when loading or unloading the washer. Among the washer control features are a digital cycle countdown to inform you of the exact time left for a cycle to be done, a LED Cycle Status Lights to indicate if a cycle is through, an adjustable End-of-Cycle signal if you feel that a load needs more washing, a safety Child Lock feature and a Delay Start of up to 24 hours. The adaptive fill water level feature makes sure that the appropriate amount of water is being used to wash and rinse a particular load. You are assured that no water is wasted with this machine. With the 11 wash cycles, you are assured that there is a cycle that matches the specific load you will put into the machine. The trademark AVC and Quiet-By-Design features that are built-in the machine assures of quiet and vibration-free operations. The front door is not reversible, which allows less flexibility in installation, as well as in loading and unloading laundry. There is no soak setting option in the machine. Unlike other washer models, this particular model does not have a self cleaning lint filter.